1894. Brand new. Courtesy Walter Anderson Collection, ESU Archives. Circa-1932. The second floor was converted to apartments, and the Scott Mouse family lived on the first floor. Carriage house to right, after its 1921 conversion to a house. Courtesy Mouse family archives. 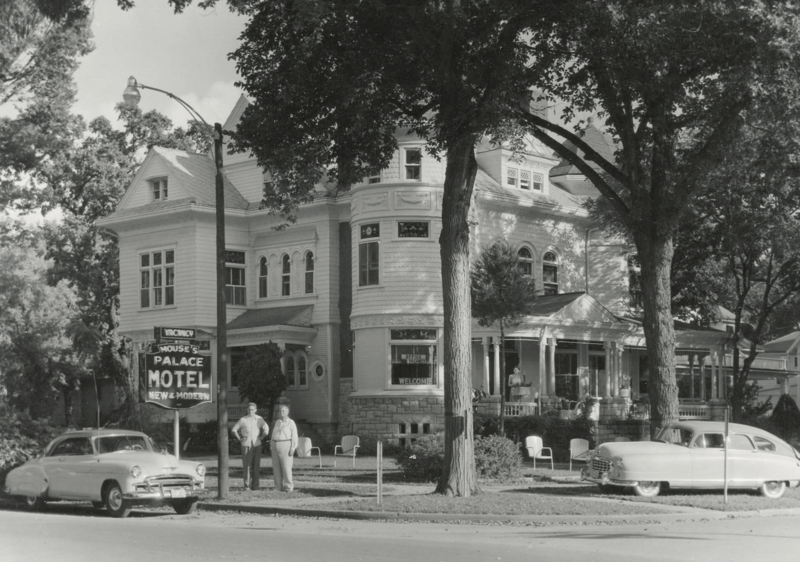 Circa-1950, after the Mouse family converted the Cross House into Mouse’s Palace Motel. Courtesy Mouse family archives. 1999. 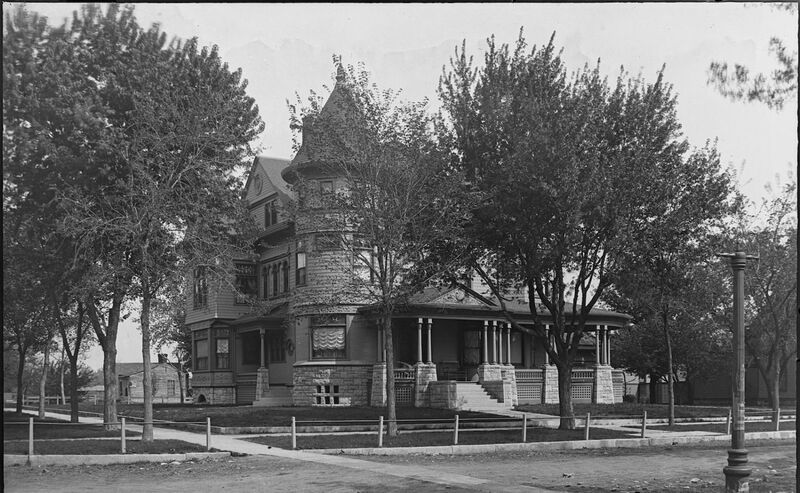 The house at its low point, boarded up and surrounded by a six-foot-high chain-link fence. This is when Debbi and Bob Rodak purchased the house. Courtesy Bob Rodak. March 2014, when I purchased the Cross House. Courtesy Bob Rodak. Summer 2015. The main facade has been repainted to its 1890s colors. August, 2017. All the secondary roofs have been redone. The tower finial has been restored. The lost finial on the octagon tower has been recreated. The porch railings are starting to be recreated. October, 2017. I have subtly enhanced the color scheme by adding some accents. Hello, Ross. I have a copper plate of the Cross House. Mary Cross was my paternal grandmother. I love that you have fallen in love with the house! I knew that Bob Rodak was unable to carry out the full restoration, and so glad that you have the requisite skills. My adult children and my cousins will be excited to see what you’ve done. Best wishes, Elizabeth (Liz) Gourlay Lang, Seattle, WA. What a thrill to hear from you! I have 5,987.648 questions!!!!!!! While Bob was not able to finish the restoration of the Cross House, I am forever grateful that his efforts brought the house to the next level. I doubt I would have purchased the house if not for all his work. I am crossing my fingers, hard, that I may be able to complete the restoration. And, if not, then I will cross my fingers that the next owner will! Thank you for restoring this treasure so beautifully! 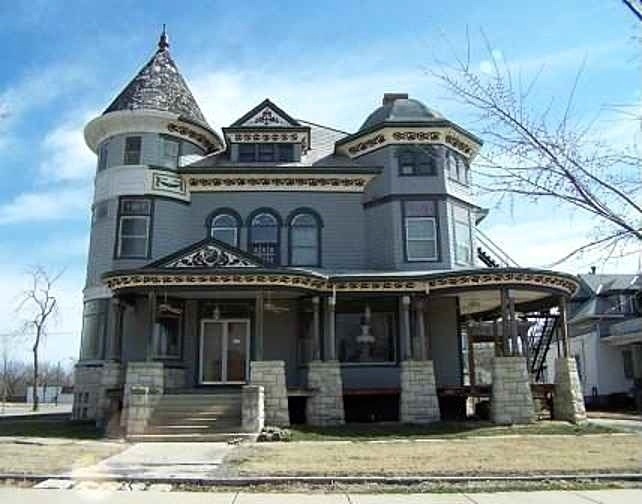 Greetings, my partner and I bought an old Victorian in Honey Grove, Texas, 404 Market Street East. We have spent, so far, five years restoring it to what we think it may have looked like 135 years ago. Please let us know what you think. The house is better known as the Erwin mansion. This is actualy the childhood home of Bill Erwin, now deceased, who appeared several times on Seinfeld, and in the movie, Somewhere In Time, as the old bellman. Your home is absolutely stunning. We welcome any advice or input. You have a beautiful home! I would love to see inside! wow this is spooky. I was reading comments and there’s my name but not the one I comment as. my name is William Channing Whitman so nice to see another William Channing. Wow. This is spooky. A relative’s name is Bill Whitman. I’m related to Marcus and Narcissus Whitman, scalped by Native Americans whilst try to convert the *heathens*. Walla, Walla, Wa. college named after them. Et vous? Christina Todd Whitman and Seymour Whitman, mayor of NY, 1904 or 1914?? The house looks magnificent. What background do you have to restore houses? It is definitely a big project. 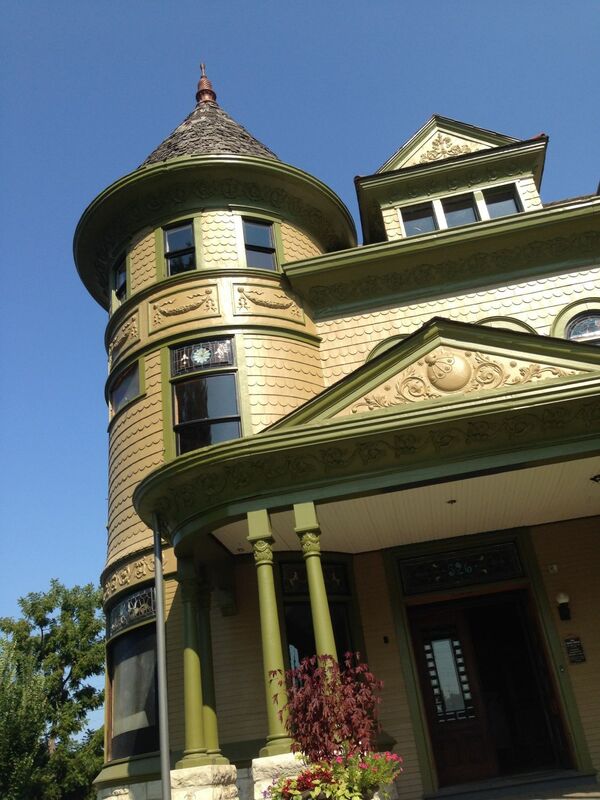 My niece is an architect here in Kansas City, who specializes in restoration and preservation architecture. Very best to you. Would like to keep in the know with your progress. I lived in your Dining Room in 1984 before I graduated from Emporia!! OUTSTANDING WORK YOU’VE DONE ROSS!! Thank you! Hats off to you! I loved living there; I was so humbled and grateful to live there. When I saw this picture, I KNEW IN THAT MOMENT the reason I desired to buy a home like this: it’s because of living in THIS home! 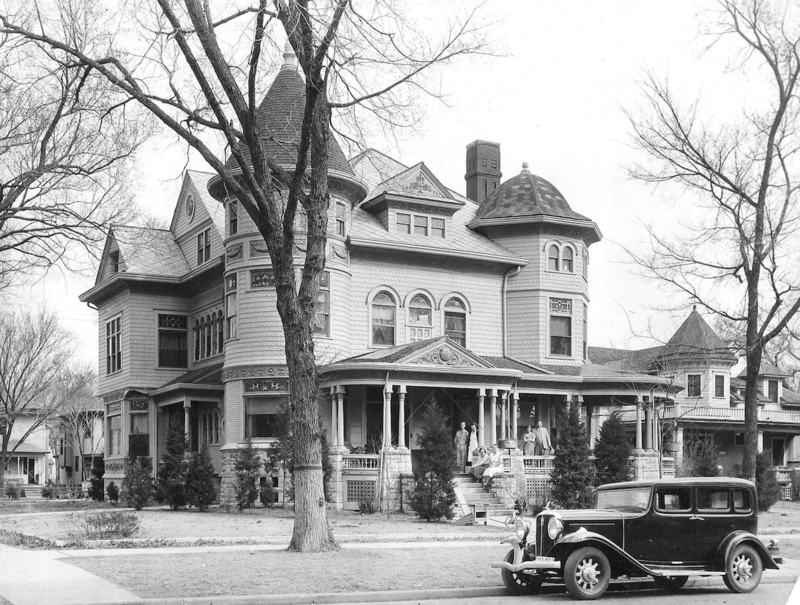 Also, I grew up in Independence, KS and there are so many old beautiful mansions there too! I’m divorced and live in Tulsa, and these homes are priced out of my budget . . . but maybe someday! I keep looking everyday! I never saw the rest of the home because it was rented out to other college students; I was thrilled to finally see the pictures of the rest of the home. There was this beautiful, serious grad student on the second floor that I always admired but never spoke to or saw on campus, yet I have a feeling she is successful and living in a home just like this one somewhere. No boys were allowed to rent (or visit) when I lived there. The Landlord lady was a VERY strict woman,and it was made clear that although I was renting a room–this was still HER home. In fact, the last image I have of her is when I was leaving for class one day out the front door. I looked back at her in the kitchen, she had an apron on, her hair was in a bun, the house smelled like bread baking, her hand was on her hip and she was watching me leave. I remember thinking, this woman really cares about each of her ‘little chicks’ (I mean tenants), [or had I played my record player too loud last night?]. I wish I was more respectful to her at times but unfortunately I was a bratty Senior. You’ve brought tears of gratitude to my eyes and so again, I extend my heart-felt gratitude to you for all you’ve done,are doing and will do, which is far more than merely restoring a home. I just watched the interview video from Circa, and totally feel the love and passion you have for the house. You talk and refereed to the property as a living thing, it is wonderful! Just love, love the way you expressed your experience, I am so jealous of you! …but very happy for the beautiful old house, just imagining the energy of such old house, the people that lived there, untold stories!! I enjoy every word of your interview!! Thanks for sharing, and I totally agree with you, to restore an old house, you need to have the main ingredient, be a bit crazy!! 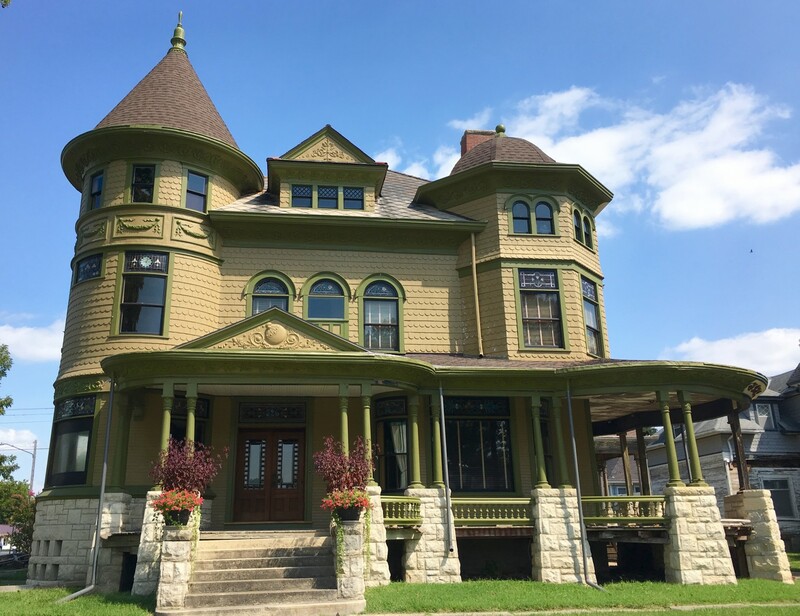 Recently discovered your blog, and well I really enjoy your attention to detail and the integrity you ibue throughout the process in restoring and transforming the historic treasure that is the Cross House. I see myself as a slightly obsessive purist that strives to keep original finishes as much as possible too. Original when it can be reused is best, when it cannot, I really admire your dedication to preserving the fabric and recreating details staying as true to the original as possible. I like to think of myself as a creative and resourceful person and well like you I notice and focus on things that others easily would overlook. Details matter and yes Necessity often inspires creativity Lessons one learns when working within a budget, and anything vintage. So I offer a possible solution to recreating an original detail in a weather resistant way that the original never could, yet nevertheless provided an interesting sightline in the front of the majestic facade that just seems a little more visually interesting and enhanced. Much like the Five reinstated rossettes that complete the detail of the trim board below the three windows above the north porch. It looked fine without the recreated rosettes, but now reinstalled, they complete the beautiful window surround and just adds a finishing touch and definitavely restores anew the original detail that make the Cross spectacular ! So I make a case for recreating the panel detail below the half round window above the main entry porch on the West entrance. However, I propose you could recreate it with extruded foam boards, and resin. Make the panel hollow, and attach it to the wall as an exterior detail, allow for voids behind the panel to allow for water to channel away from behind it so rot will not affect the panel. So Like the original capitals recreated in resin,on the main porch, this detail could be cast and applied as one continious piece reinstalled and weather secure. Why should I care, because as I read this I know the original details matter, and the trade-off does make sense, but when you see the original pictures it is there, and although beautiful shingled, in its current state, it’s absence is well kind of missed too. Being equally dedicated to the original I know it was a hard choice to make. So just an idea how this detail could be done to restore an original finish detail without compromising structural integrity and keeping everything watertight. In any case I absolutely enjoy your account and seeing your transformation. It is Remarkable to see and follow your dedicated progress in preserving this jewel. Very nice to “meet” you! And thank you for the kind words. You seem a kindred spirit. I have a solution to the “issue” and will be doing a post about this soon! The shingles were always meant to be temporary until I figured out something permanent. And now I have! Ross, I too saw the interview on Circa and I am so impressed with your dedication to keep this history alive. You can be so proud of yourself. 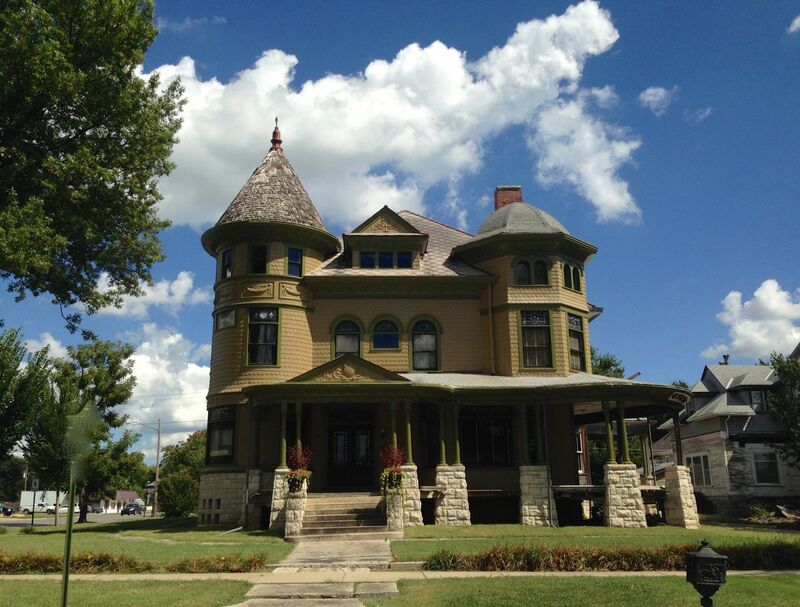 I live in Liberty, Missouri where there is over 100 historic homes. William Jewell College, a wonderful community. So amazing! Great job I love it! Can you please post some updated pics? I’m so curious to see your progress. 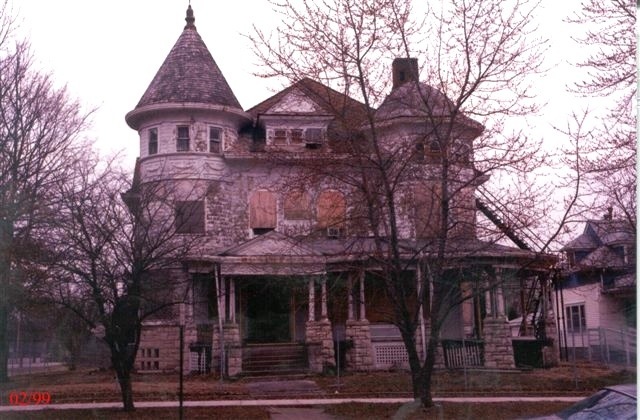 It’s my dream to buy an old home and restore it. I post almost daily. If you follow the blog along you will see lots of updates! I did notice that the veranda/porch posts in 1896 and 1932 appeared to be 3 tone. Did you choose not to go that way? Thank you for restoring the past and sharing your progress. It breaks my heart watching all the old craftsmen style homes in my area (with all their intricate details and nooks and crannies) replaced by ugly, soulless, flat stucco. I did paint the column originally in what appeared to be their 1893 3-tone finish. It looked weird! With the shafts the same color as the walls, the columns did not have enough visual weight to hold up the porch roof! So I changed them to the dark olive color. I see. I do love the colour choices!! Is the entire house painted that one color. Or is it just the front? I do not understand. The house is being painted in a 3-color scheme. I meant is the front color scheme the same as the sides, The street view of the house showed that it was painted white on the sides and yellow-ish on the front. I am working my way slowly around the house. The main facade (west) is finished, and I am now completing the north facade.